Hong Kong is a city where you can’t escape signs. Even the buildings are signs advertising international finance and exchange. The ICC, for example, holds the Guinness World Record for having the largest light and sound show on a single building. Indeed, one of the things that makes Hong Kong a fascinating place to wander through as a tourist are the signs that visually assault you. The combination of faded paint and rusted metal, hang over the streets in such way that one wonders how in a place prone to Typhoons they could still be there. As you get your eye in, however, there is a repetition to some of the signs. You see the sign in the photograph all over Hong Kong. Supposedly representing a bat holding a coin, they are the sign indicating a pawn shop. Pawn shops in Hong Kong are more pawn brokers or payday type lenders than shops where you can sell your valuables or buy someone elses. In fact, you can not buy anything at the pawn shops here. The way it works is you take your valuables or the deed to your property to the pawn and they will loan you what it is worth. They keep your goods for up to four months and in return you pay the original loan amount plus 3.5% per month interest. If you don’t pay, they sell your items to a resaler, antique dealer or via some other suitable means. Legally, the pawn shops are not supposed to give loans for more than HK$100,000, but they are known to do so according to one report in the SCMP. What makes them particularly attractive to most people however is the fact that they will provide quite small loans, with simple terms and limited paperwork. The first Pawn shop opened in Hong Kong in 1926. They flourished after World War 2 with the inflow of Chinese migrants from the mainland, then seemed to dwindle in importance until recently they seem to have made a comeback. Earlier this year, a firm called Oi Wah Pawnshop Credit, the largest provider in the city, was floated on the stock exchange in a public offering. Although it is not making investors profits, it also doesn’t seem to be losing a whole lot of value either. Somewhat ironically, one of the key reasons for the existence of pawn shops in Hong Kong is the local fascination for betting on the horses. Gambling is both a blessing and a curse in Hong Kong. The horse racing is run through the Hong Kong Jockey Club, which also is one of the city’s biggest charities. Horse racing was introduced by the British and the Jockey Club was established in 1984. In 1954, the Jockey Club formally declared that profits after expenses would be put toward charitable causes in the city. Currently the Jockey Club runs programmes all over Hong Kong that do everything from support elderly people to working with local youth groups to develop arts projects. According to its own web site, the Jockey Club is one of the 10 largest employers in Hong Kong with 26,000 employees. Race days are Wednesdays and Saturdays throughout the autumn, winter and spring, though there is no racing in the summer because it is too hot for the horses. This charity is of course supported, at the end of the day, by gambling. Gambling is part of life in Hong Kong. One study reported in the SCMP indicated that 70% of the population had doen some form of gambling in the previous year. After buying lottery tickets and playing Majong, betting on the races was the third most frequently participated in betting activity. On a typical race day there are approximately 7 million betting transactions. Up to a billion Hong Kong dollars is bet when there is a major meeting. A recent study revealed that over half of all secondary students in the SAR (aged between 12 and 18) have gambled and about 5% are “problem gamblers”. Though children are generally not gambling at the horse races, there are indicators that children who gamble are more likely to come from families where the adults are addicted gamblers. When betting has taken all the money, the pawn shop fills the gap. Of course gambling is not the only reason people use the pawnshops. Many use them as stop gaps to stretch monthly incomes. Thought of as payday lending, people borrow at the end of the month to buy food and other goods and pay bills, then on the first of the month pay off their loans. According to a BBC report, a large customer group are the foreign domestic helpers who cannot access bank loans because of their residency status, which positions them as always temporary and linked to a particular employer. In a city where significant numbers of the population live on very little, the pawnshops offer a safe form of lending because they are, unlike shadow lending, regulated. Thus the pawnshops are a key resource, though there are not studies that show the extent to which people borrow in this way. Indeed, the IPO listing of Oi Wah Pawn shop revealed that in 2012 the business had a revenu of HK$66.3 million (about US$ 8.5 m) of which approximately half is profit. Each day, each of its shops nets approximately HK$16,000. In the financial services sector this is tiny, but for those with limited choice it is huge. While I had seen the distinctive pawn shop signs many times, I first learned what they meant, not by frequenting a pawn shop but by going to a restaurant in Wan Chi called The Pawn. In the restaurant there is one wall with photographs of many different versions of the pawn shop sign pictured above. 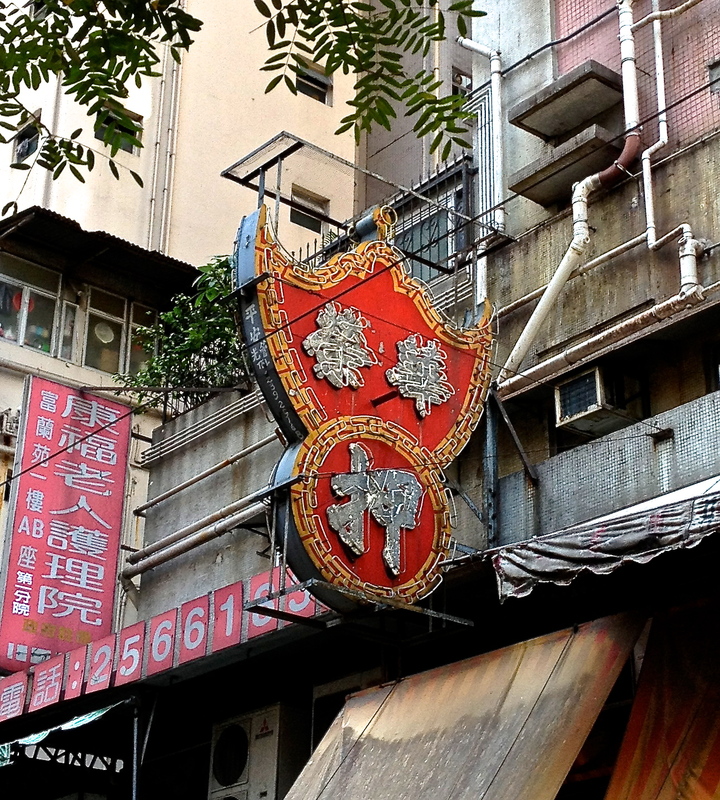 This restaurant/bar is located on Johnson Road in a building that was once, according to the Hong Kong Tourism Board, the Woo Choeng Pawn Shop. The building was taken over by the Urban Renewal Authority and refurbished and “preserved” as a restaurant. One of the initial agreements with the local community was that the roof of the building would be available to use as public space, but in practice this in not the case despite the use of public money to preserve the building. The bar itself is quite stylish. It tends to be frequented by expats and tourists. The food is british gastro-pub type fare and expensive and the service, in my experience tends to be somewhat neglectful. It does have, however, some really wonderful cocktails. I would recommend the wasabi martini in the winter time with its wonderful mix of gin, cucumber, wasabi, ginger and lemon juice. For the summer they do a really wonderful Mojito. You can get a sense of the drinks and food on offer from the web site, but what is posted in not necessarily the menu you will find upon arrival, particularly with regard to the food menu, which appears to have been scaled back considerably. From the outside the building invokes notions of a Hong Kong from an earlier era, which is difficult to find these days. Unfortunately the redevelopment has been criticised as being development for the upper classes, rather than preservation. There is not much in the internal decor that reveals the building’s former use.The shell of the building remains, but there is little else that is available to local people, which brings me back to the stock market listing. In addition to being the first IPO of a Pawnshop chain in Hong Kong, one of the reasons it was deemed by experts to be a viable investment was because of the potential for the business to be not a pawnshop, but instead a shell company through which other activities can be funnelled. This is again a sort of stripping away of the content for the benefit of the wealthy. If you want to see a real pawn shop in Hong Kong, however, you still can. They are relatively ubiquitous…all one need do is look for the sign. This is part of the WordPress Weekly Photo Challenge: The sign says. You can find it and other entries here. The Hong Kong Heritage Museum also has a mock up of a pawn shop where you can see what the inside might look like complete with high desk and screen to block the prying eyes of those on the street. This entry was posted in Hong Kong, Social Positions and tagged Asia, dailypost, debt, Guinness World Record, Hong Kong, Jockey Club, pawn shop, Pawnbroker, regeneration, South China Morning Post, Travel, Urban Renewal Authority, Weekly Photo Challenge: The sign says by geofoodie. Bookmark the permalink. pawn shops and gambling sorta’ go together I guess??? Yes. What I found ironic was that through the public listing the pawn shops themselves become part of the gambling landscape, not just a service for gamblers. It makes one think a bit about the line between what is virtue and what is vice. Yea, me too. But at least you get to do it in wigs! Come join, it’s most liberating.